Central Business Sales is delighted to offer to the market a rare opportunity to purchase a successful, well established traditional fish and chip shop takeaway. The present owner has run the business for the last 14 years and now wishes to retire. The takeaway benefits from a strong repeat trade as well as a high level of business from the local school at lunchtime. The area has also benefited from the many housing developments that have been built with more due to start within the next few months. 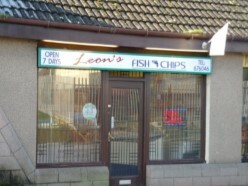 Troon is a very popular location with the business located in a prime site. The owner runs the business as a fish and chip shop, offering a full menu including traditional suppers such as fish, sausage and chicken. The owner feels that someone new coming in can take the business forward by offering pizza, kebabs and burgers. The takeaway doesn't currently offer deliveries and this is another area where the business can be expanded. The premises are approximately 55m² and would benefit from being modernised. The large double front premises lead into the main serving area. There is a food preparation area with a deep fat frying system and a large kitchen area with excellent storage lies to the rear. A large free car park lies to the rear of the premises. The business is being offered on a leasehold basis with 7 years left on the current lease with an extension available. The rent is £175 per week and 100% rates relief applies under the Small Business Bonus Scheme. The takeaway is open 12:00-1.30 and 4pm-9pm Monday to Friday, 4pm-9pm on Saturdays and is run by the owner and one part time employee.